From the neglected graveyard we moved on to the King Tut exhibit at the Egyptian national Museum. It was mind-boggling. Tutankhamen, the boy king, was only seventeen when he died. He was buried with solid gold chariots and thousands of golden artifacts. His gold coffin was found in a burial site filled with tons of gold. The Egyptians believed they could take earthly treasures into the afterlife. But all the treasures intended for King Tut’s eternal enjoyment stayed right where they were until Howard Carter discovered the burial chamber in 1922. I was struck by the contrast between these two graves. Borden’s was obscure, dusty, and hidden off the back alley of a street littered with garbage. Tutankhamen’s tomb glittered with unimaginable wealth. Yet where are these two young men now? One, who lived in opulence and called himself king is in the misery of a Christless eternity. The other, who lived a modest life on earth in service of the one true King, is enjoying his everlasting reward in the presence of his Lord. Tut’s life was tragic because of an awful truth discovered too late-he couldn’t take his treasures with him. William Borden’s life was triumphant. Why? Because instead of leaving behind his treasures, he sent them on ahead. We’ll each part with our money. The only question is when. Jesus warns us not to store up treasures on earth, not just because wealth might be lost; but because wealth will always be lost. Either it leaves us while we live, or we leave it when we die. No exceptions. He wants us to store up treasures; he’s just telling us to store them in the right place! Anything we put into the Father’s hands will be ours for eternity. If we give instead of keep, if we invest in the eternal instead of the temporal, we store up treasures in heaven that will never stop paying dividends. You can’t take it with you, but you can send it on ahead. In 1990 I was a pastor of a large church, making a good salary and earning book royalties. I was also on the board of a crisis pregnancy center and we had opened our home to a pregnant teenager. My burden for the unborn grew and I began participating in peaceful, nonviolent rescues at abortion clinics. For this I was arrested and sent to jail. An abortion clinic won a court judgment against a group of us and I discovered that my church was about to receive a writ of garnishment demanding that they surrender one-fourth of my wages each month. The church would have to either pay the abortion clinic or defy a court order. To prevent this from happening, I resigned. I’d already divested myself of book royalties. The only way I could avoid garnishment was to make no more than minimum wage. Fortunately, our family had been living on only a portion of my church salary, and we had just made our final house payment, so we were out of debt. Another court judgment followed, involving another abortion clinic. Though our actions had been nonviolent, the clinic was awarded the largest judgment ever against a group of peaceful protestors: $8.2 million. It seemed likely we would lose our house. By all appearances our lives had taken a devastating turn, but it was one of the best things that ever happened to us. We began a new ministry. My wife worked at a secretary’s salary, supplementing my minimum wage. All of our assets, including the house, were hers. Legally I owned absolutely nothing (and I still don’t). This wasn’t the first time God taught me about his ownership. I once loaned a new boom box to our church’s high school group. It came back beat-up and that bothered me. But the Lord reminded me it wasn’t my boom box—it was his. And it had been used to help reach young people. Who was I to complain? I also owned thousands of books that I valued highly. I loaned them out, but it troubled me when they weren’t returned or came back looking shabby. Then I sensed God’s leading to begin a church library. I started looking at the names of those who checked them out, sometimes dozens of names per book. By releasing the books, I was investing in other lives. Suddenly the more worn the book, the more delighted I was. My perspective totally changed. God used those court judgments to take my understanding of his ownership to a new level. Scripture really hit home: “The earth is the Lord’s, and everything in it, the world, and all who live in it” (Psalm 24:1). God is the owner of everything and he was teaching me, in the crucible of adversity, the life-changing implications of that truth. If God was the owner, I was the manager. I needed to find out what he wanted done with the assets he had entrusted to me and then carry out his will. Every spring my wife and I read through dozens of letters from people in our church who are going on summer mission trips and I’m like a kid in a candy store. Why such excitement? Because we get to hear the stories and read the emails. We see the enthusiasm, the growth, the changed priorities. We gain vested interest in more facets of God’s work around the world. Your heart will follow your treasure. Do you wish you cared more about eternal things? Reallocate some of your money from temporal things to eternal things and watch what happens. Jerry Caven had a successful restaurant chain, two banks, a ranch, a farm, and real estate ventures. At age fifty-nine Jerry was searching for a nice lakeside retirement home when God led him to put his money and time overseas, investing substantially in missions. What changed the Cavens’ attitude toward giving? We never did lose our house. While paying me a minimum-wage salary, the ministry owned the books I wrote. Suddenly royalties increased and we were able to give away about 90 percent [in recent years that amount has changed to 100 percent] of them to missions, famine relief, and prolife work. I don’t go to bed at night feeling that I’ve “sacrificed” that money. I go to bed feeling joy because giving interjects an eternal dimension into even the most ordinary day. It is a giant lever positioned on the fulcrum of this world, allowing us to move mountains in the next world. Because we give, eternity will be different—for others and for us. When the ten-year judgment period on the lawsuit expired I was offered the chance to start taking royalties again. Nanci and I talked it over and decided we don’t need a higher standard of living, a better house or car or more insurance. So, with joy in our hearts, we said, “No thanks.” They’re not our royalties; they’re God’s. We don’t need a hundred thousand dollars. We do fine on a lot less. God provides for us faithfully and we get to experience one of life’s greatest thrills—the joy of giving. Alfred Nobel dropped the newspaper and put his head in his hands. It was 1888 and the Swedish chemist had made a fortune inventing and producing dynamite. His brother Ludvig had died in France, but an editor had confused the brothers and Alfred was reading an obituary in a French newspaper—not Ludvig’s, but his! Under the headline, “The Merchant of Death is Dead,” the obituary described a man who had gotten rich by helping people kill one another. Shaken by this appraisal of his life, Nobel resolved to change his legacy. When he died eight years later, he left more than $9 million to fund awards for people whose work benefited humanity. The awards became known as the Nobel Prizes. Alfred Nobel had a rare opportunity—to invest his wealth in something of lasting value. Ask yourself, Five minutes after I die, what will I wish I had given away while I still had the chance? Why not give it away now and close the gap between what you’ll wish you had given and what you really are giving? Nobel managed to change his legacy in this world. We have the far more strategic opportunity to change our legacy in the world to come. When I think about the giving opportunities the Lord repeatedly blesses me with, I can’t help but feel part of something much larger than my little corner of the world. We have no way of knowing how long our prosperity will last. Why not give away the abundance while we still can until our hearts are more in touch with God’s work than with our remodeling projects, business ventures, dream vacations, or retirement plans? I invite you to send your treasures on to heaven, where they will safely await you. When you do, you’ll feel the freedom, experience the joy, and sense the smile of God. 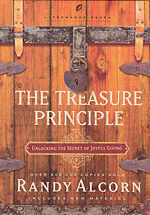 For more, see our resources on money and giving, as well as Randy's related books, including The Treasure Principle and Money, Possessions, and Eternity.